Atta Ullah Khan Essa Khailvi (Issa Khailwi, Niazi) is a famous Seraiki/ Punjabi/ Urdu Folk Singer and Poet of Pakistan. 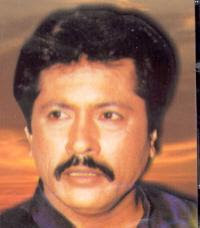 He is one of the best Pakistani Folk Singer ever born. In the beginning, He was a Rebel for his family. Atta Ullah Khan Essa Khailwi is also very much popular in India, UK, USA, UAE and all over the world where Punjabi Speakers are lived. Atta Ullah Essa Khailwi’s many songs were taken in many Pakistani Urdu & Punjabi and Indian Movies. Attaullah Eesakhelvi was by-passed the music establishment by heralding a cassette revolution in Pakistan. Atta Ullahj Khan Essa Khailwi is the only singer of the world which is famous in especially one profession i.e. Drivers (Truck Drivers, Bus Drivers, Taxi Drivers…). Date of Birth of Atta Ullah Khan is 19 August 1951. First show was broadcasted from Radio Pakistan Bahawalpur in 1972. First Stage Show was arranged in Mianwali in 1972. First Foreign Concert of Atta Ullah Khan was in England in 1980. He has recorded more than 40000 songs in 7 different languages. Atta Ullah Khan Essa Khelvi also works as an actor in a few movies. He has the world record on Guinness Book of World Record for the highest number of audio albums (over 400 albums) ever released by a singer. Famous Film Actress of her time Bazigha was married with Atta Ullah Khan Essa Khelvi. Atta Ullah Khan Essa Khelwi has left his singing career and has joined Tablighi Jamaat. Atta Ullah Khan is an educated folk singer. He has a bachelor degree (B.A.). Government of Pakistan awarded him with the “Pride of Performance” in 1992. Moreover he is also granted with hundreds of other awards.